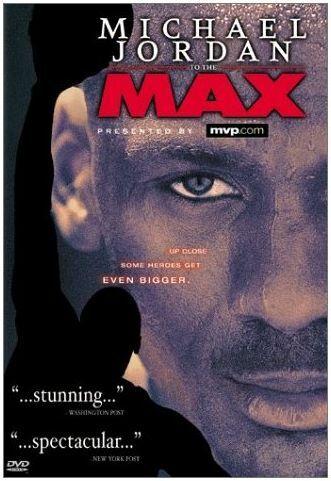 While Michael Jordan To The Max was originally a 45-minute documentary made for the IMAX format, it has great behind-the-scenes footage, terrific game material, and gets close to Jordan in practice and on the court that makes it a excellent DVD. It also includes a number of greatest hits, including his commercials and most memorable dunks. The action is on! Michael Jordan explodes on the screen in this box office hit. Follow Michael Jordan's last basketball season as he leads the Chicago Bulls to their sixth NBA championship. Michael Jordan To The Max provides a rare glimpse of Jordan on and off the court. Featuring electrifying court action and candid interviews with Phil Jackson, Steve Kerr, Doug Collins and Bob Costas. Get ready to experience some of the greatest moments in modern sports history from one of the most dominant sports legends of all time. Editor's Note (Amazon.com): A cinematic homage to one of the greatest NBA basketball players ever, "MIchael Jordan To The Max" is a loving documentary that focuses on the last season the world-class Chicago Bulls player took part in before hanging up his sneakers. It was originally presented in IMAX format, but watching Jordan's signature jumps and plays is just as compelling on video and DVD. Narrated by Laurence Fishburne, the film explores Jordan's various moments of athletic genius, showing highlights of several tense games in which Jordan saved his team from defeat. The film also uses footage of Jordan's appearances in TV commercials, and in various interviews, which illustrate his unique personal dedication to sports, and to kids. This is not an in-depth biography, but rather an entertaining and highly inspirational portrait of a great athlete.